Sacramento, California - Alpine Cabinet Company "
Simplifying your life in Sacramento is as easy as the storage and organization solutions from Alpine Cabinet Company. Custom garage cabinets, custom closets, home offices, and entertainment centers are our specialty. 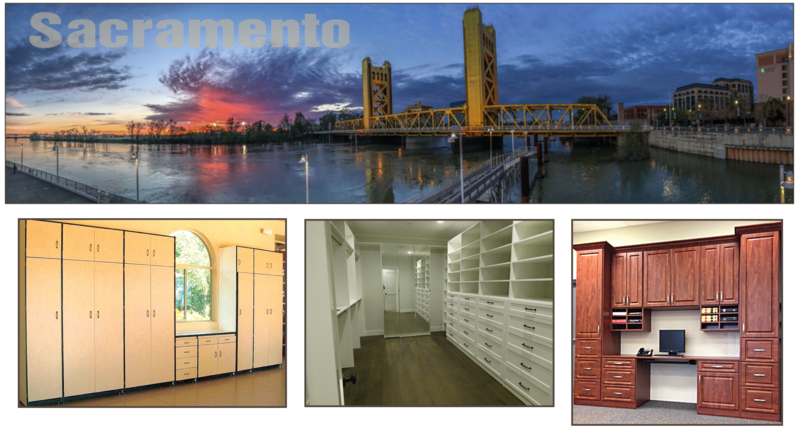 Established in 1984, we have served Sacramento and the greater Sacramento community by building and installing garage cabinets, custom closets, home offices, and entertainment centers. Our cabinetry is precisely crafted in our locally owned 25,000 square foot facility. With personal, courteous, and professional service, Alpine has installed more than 32,000 home improvement projects. Our customers praise our professionalism and attention to the smallest detail. From free in-home estimates, custom design services, and installation, we will walk you through the process. Our garage cabinets are designed to provide you with superior strength and stability, so you can organize your space with virtually no limits. Alpine Cabinet Company transforms your walk-in and reach-in closets to maximize space and storage. From dedicated home offices to space saving options, Alpine has the answer. Entertainment centers discretely store your electronics and stylishly display your collectibles. Contact us so we can build you the ultimate organization and storage solution. Serving Sacramento and surrounding communities such as Florin, Rio Linda, and Clarksburg.